Dimensions 1.70 by 7.30 by 9 in. Discover the Power of LinuxâCovers macOS, too! Linux is todayâs dominant Internet server platform. System administrators and Web developers need deep Linux fluency, including expert knowledge of shells and the command line. This is the only guide with everything you need to achieve that level of Linux mastery. 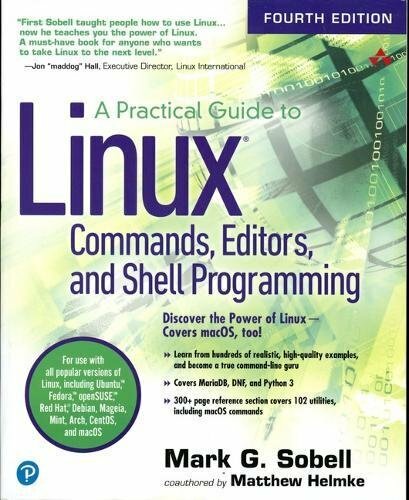 Renowned Linux expert Mark Sobell has brought together comprehensive, insightful guidance on the tools sysadmins, developers, and power users need most, and has created an outstanding day-to-day reference, updated with assistance from new coauthor Matthew Helmke. This title is 100 percent distribution and release agnostic. Packed with hundreds of high-quality, realistic examples, it presents Linux from the ground up: the clearest explanations and most useful information about everything from filesystems to shells, editors to utilities, and programming tools to regular expressions. Use a Mac? Youâll find coverage of the macOS command line, including macOS-only tools and utilities that other Linux/UNIX titles ignore.